The concerns raised by viewers in regards to the movie “A Story Sadder Than Sadness“, once troubled the female lead Lee Bo Young as well. Despite the director’s background as a well-known poet, Lee Bo Young remained doubtful of this new director who has not yet proven himself. However, owing to her pride of wanting to challenge herself, Lee Bo Young joined the team. That was not the last of the problems though. During the beginning half of the movie production, Lee Bo Young had trouble with both Director Won Tae Yeon and her co-star Kwon Sang Woo. Director Won Tae Yeon would often passed down inconceivable instructions. A quote from Lee Bo Young would be “poem-like”. The words used by the director were so profound that their communication was on the verge of collapse. After four takes, her acting remained the same. Therefore, one day Director Won invited Lee Bo Young to a restaurant which sells Sashimi. He poured Lee Bo Young a glass of soju, and with no beating around the bushes, asked her: “What exactly are the things you are not satisfied with?” During the split moment, Lee Bo Young was hurt, in her pride. After gobbling down the soju in one swoop, she churned out all the discontent that she had accumulated during the past months. That glass of soju turned out to be a “reconciliation wine” for them. “Due to the many troubles before this, I cried out loud after watching the movie. I feel that the end movie is indeed 100 times stronger than the script. Anyone who watches it may also feel the same way. Radio PD Kay (kwon Sang-woo) meets writer Cream (Lee Bo-yeong) in high school. Kay and Cream are orphaned on the same day which brings the two together. Although the movie stars are in their 30s, they feel young enough! In regards to the various rumours and speculations behind Son Tae Young’s pre-marriage pregnancy, husband Kwon Sang Woo finally made a direct reply in MBC’s “Golden Fishery” that was broadcast yesterday (25th). 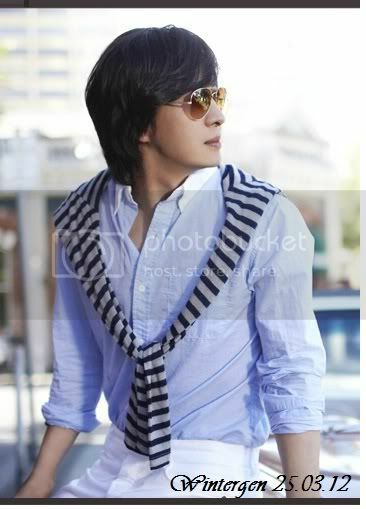 During the show, Kwon Sang Woo made official clarifications on the circulating rumours such as “pre-marriage pregnancy” and “plans in giving birth overseas”. Apart from these, there was also a rumour regarding their plans to give birth overseas after they travelled to and fro Australia and America frequently. Actress Son Tae Young has given birth to a healthy baby (son) at a maternity hospital in Kang Nam, Seoul (Jan 6th). It was reported that Son Tae Young felt a series of sharp pain yesterday and eventually gave birth to her newborn son through natural childbirth means at the hospital, 3 weeks in advance of her estimated delivery date on the 27th. According to the report, both Son Tae Young and her newborn son are in healthy conditions and they have moved back to their home for recuperation instead of staying at the hospital. Congratulations to both of them and their newborn son. That was early by the way. New groom Kwon Sang-woo was ranked number two in a recent survey that asked Japanese women to choose the best young Asian actors.According to Phantom Entertainment, Kwon placed second in the survey conducted by “SmaSTATION,” a popular show on Asahi TV. The show is hosted by a member of the popular Japanese idol group SMAP. The recent survey was conducted on 500 Japanese women. Taiwan’s F4 took the number one spot while China’s Jay Chou took the number three spot. 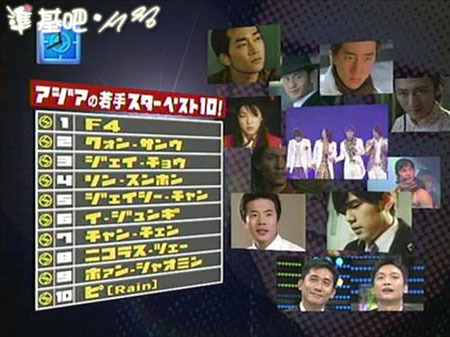 Song Seung-heon and Lee Jun-ki ranked fourth and sixth, respectively.